Limited and under-used open space is maximized by creating private and shared access balconies, spaces of different character, settings for different types of activity, including residents’ gardening. Reduced parking and treatment of external space as shared surfaces allows safer informal play. The location of the new multi use games & play areas allow for good natural surveillance. The community centre in its new position benefits from both a street presence and direct access onto the newly landscaped courtyard. 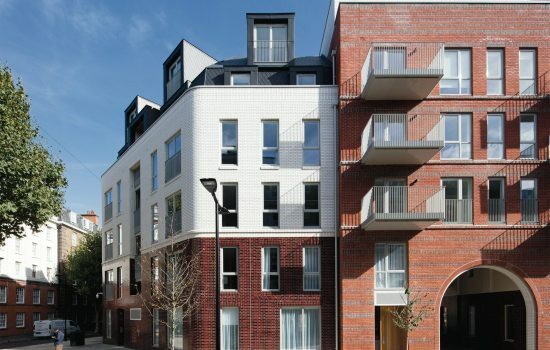 The Bourne Estate residents were involved from the outset by selecting Matthew Lloyd Architects from a shortlist of practices put together by Camden following a competitive tender. The design was developed through ongoing conversations with the estate’s residents; feedback on options was gained on a regular basis through newsletters, a series of open exhibitions, at which attendees were encouraged to complete feedback forms, followed by regular working group meetings. Issues arising were overcome with genuine consultation in which people knew their voices were heard. The process included taking time to really get to know the estate and talk about its qualities, architectural features and what people who live there like about it and why, as well as their concerns. Issues which were important to residents, to be addressed by the regeneration, in addition the provision of new housing, included: a site strategy to consider security, antisocial behaviour, noise, routes and connections, the positioning of buildings and open space, scale and character, details and materials. Residents had an important influence on the scheme, an example is the design of the new main entrances to the estate as large arches in the spirit of the existing which was requested by residents. Schedule of accommodation: 1xStudio; 22x1-bed; 35x2-bed; 14x3-bed; 3x4-bed.